Collector demand is pushing your 1874 Indian head penny value higher. It’s apparent today’s available supply of this coin is not enough to fill current demand. Compared to following years a relatively small number of these 1874 pennies are around today. Fewer still in well preserved condition. It is one of those coins that should be examined closely, it has potential. As to the value of your coin, special attention is placed on condition. Those examples still displaying some of the finer details within their design are very desirable. Have a close look at the headdress area, finding feathers clearly separated indicates a coin worth a premium. To the right is pictured an exceptional and rare 1874 penny, never circulated and still bright as the day of minting. It’s a good example of an Indian penny displaying its full design. Easily valued at $143 because of steady demand. Reflected in their values these old pennies from the 1870’s are not as common as once thought. 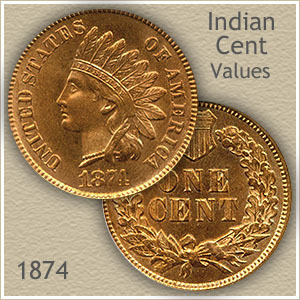 Your coin may be worn, the design somewhat faded, however it is needed by many assembling collections of Indian pennies. 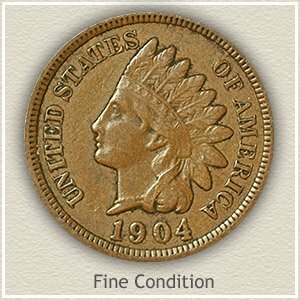 In the market, values of old Indians pennies rely on the amount and quality of detail remaining to the surface of the coin. Missing metal due to wear is one of the major factors lowering value. However, if your coin is missing any of the often found common damages, it's highly collectible. 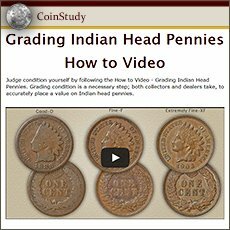 Finding premium 1874 Indian head penny value frequently rests on avoiding certain negatives. Many 100 plus year old coins suffer from a bad rim nick, scratches or dark color. Severe problems include corrosion, bent coins and in many collectors opinion, those that have been cleaned. The above chart highlights coin values according to their condition and grade. After careful examination and finding your coin is damage free, its value is secure for the grade. Pictured is the obverse and reverse of a nice 1874 penny. Lightly worn, missing some high point detail but also as important, missing any detracting faults. Well received by collectors and when auctioned it took a bid of $95 to place this coin in a collection. The value chart lists coins in different "grades" depending on the amount of wear. 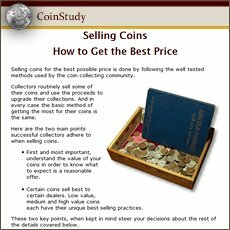 Known as grading, compare your coin to the images and find the best match. Noticeable features separate the varying degrees of possible wear and are highlighted below. These subtle distinctions change your 1874 Indian head penny value. Uncirculated: Rare is an 1874 penny in "uncirculated" condition. It is a coin that has never circulated and there is no wear to its surfaces. To confirm your coin is in this condition examine the very ends of the feathers, if wear is present it smoothes the normal "grain" and flow lines of the metal. Her cheek and extending to include the chin is another area prone to early wear. Again a worn surface shows smoothing to the metal, a distinctly different look compared to the surrounding area. Extremely Fine: Sharp detail remains on Indian pennies in extremely fine condition. Although some flattening from wear is evident it is found only on small portions of the coins. Within the head band "Liberty" is one of the highest points of the coin and the first to wear. It’s important all letters must be present to reach the extremely fine grade. 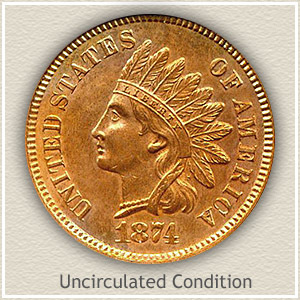 Fine: As a collectible coin, in nice condition 1874 Indian head penny value is generally double a lesser grade example. Moderate with ample detail remaining is the appearance of a "fine" grade penny. Wear has reduced the highest details considerably but not to the point of merging one into the other. The ribbon behind her neck is still separated from the hair, although worn smooth as it crosses. Her forehead is fully detailed and apart from the headband. The headband despite obvious wear still portrays "Liberty." Good: 1874 pennies in "good" condition are collectible and worth a nice premium. Although worn to almost an outline, her portrait still shows slight detail. The lettering and date along the rim is clearly visible but in shallow profile. 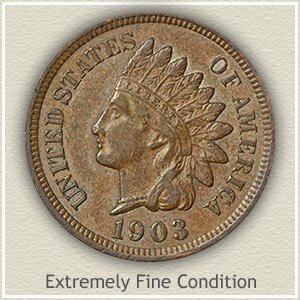 If it has avoided any serious dents and nicks and is not any worse than just described, your 1874 Indian head penny value is solid for the grade. $1 to 2 dollars for common dates. With many advanced collectors pursuing Indian pennies and forming great collections the rare dates are rapidly moving higher in value. Better condition coins are especially sought. Your box of old coins has never been more valuable.